Geography is the study of Earth’s land, water, people, and other living things. It is important to know the world around you. Geography plays a part in where and how people live. Below are key terms, important to the lessons to follow. The Sky Islands are a series of forested mountain ranges surrounded by “seas” of desert and grasslands. A wash is a dry river, stream, creek bed or gulch that temporarily fills with or flows with water after heavy seasonal rains. In Spanish a wash is called an arroyo. Topography is the graphic representation on a map of the surface features of a place or region; included are the relative positions of mountains, valleys, plains, bodies of water and elevations. 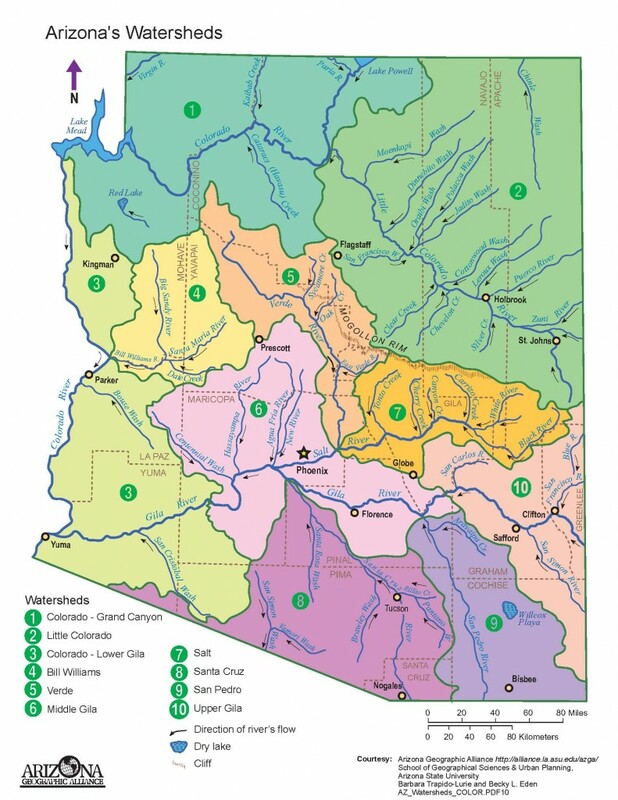 A watershed is an area or region (bounded by high elevation points) drained by a river, river system, or other body of water. Each watershed has its own network of river and stream channels that drain water from and through a particular basin. Highest elevation is 1350 ft. Highest elevation is 2500 ft. Highest elevation is 5000 ft. The term, “sky island” was “coined” by Weldon Heald in 1967 to describe mountain ranges that were isolated and separated from one another by vast valleys of grasslands or desert. The valleys act as barriers to the movement of some woodland and forest species, in the same way that saltwater seas isolate plants and animals on islands located in the world’s oceans. That is why sky islands are comparable to the ocean’s archipelagos (chains or clusters of small land masses or islands separated by sea water). The Sky Islands region includes a 70,000 square mile region in southeastern Arizona, northwestern Mexico and southwestern New Mexico. Plants and animals from four ecosystems: the Rocky Mountains, Sierra Madre Mountains, Sonoran and Chihuahuan Deserts, can be found in the Sky Islands. There is great biological diversity of flora and fauna species and habitats within the region. Some rare species are not found anywhere else in the United States. Black bears, jaguars, ocelots, mountain lions, Arizona white-tail deer, coati-mundis, snakes, lizards, bees, butterflies, and ants are found within the region. Over 50% of North America’s species of birds, 29 species of bats, 104 species of mammals and 3000 species of plants can be spotted in the Sky Island region also. Southeastern Arizona is known worldwide for its magnificent bird watching opportunities. Birdwatchers from around the world, seek out five-striped sparrows, blue grosbeaks, Mexican chickadees, over 18 species of hummingbirds and others. Major Sky Island ranges in Arizona include the Baboquivari Mountains, Chiricahua Mountains, Huachuca Mountains, Pinaleño Mountains, Santa Catalina Mountains and Santa Rita Mountains. Three climate zones – temperate, sub-tropical and tropical, intersect and blend within this large region. Desert scrub, grassland, chaparral, woodland and forest biomes occur within the region. The higher, cooler and wetter elevations include numerous flora and fauna species not seen in the deserts and grasslands areas that surround the mountains. Unfortunately, the Sky Island wilderness areas and their plant and animal life are being threatened by accelerating human interaction, land development, climate change, fire control, recreational vehicle use and removal of resources. The Coronado National Forest covers 1,780,000 acres of southeastern Arizona and southwestern New Mexico. Elevations range from 3000 to 10,720 feet in twelve widely scattered mountain ranges or “sky islands” that rise dramatically from the desert floor in a nearly parallel pattern. 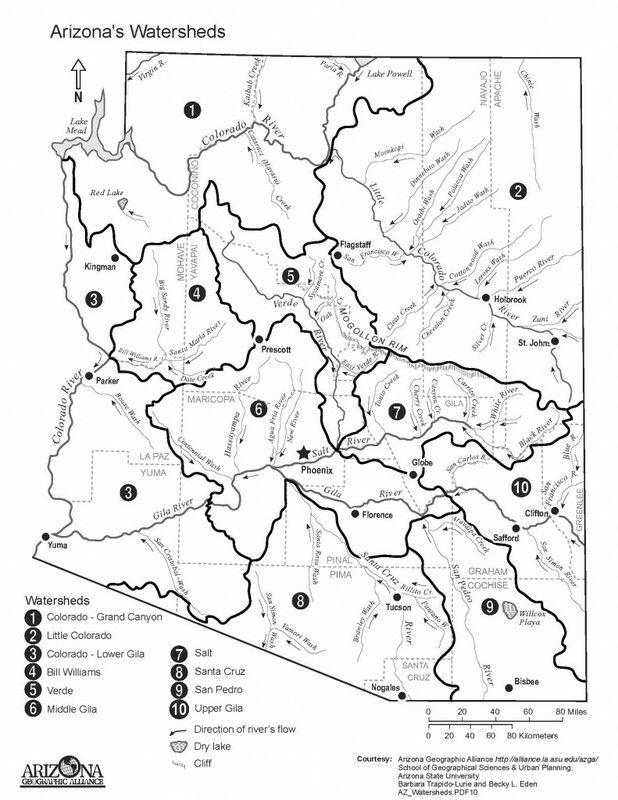 Study the Arizona Geographic Alliance’s Arizona’s Indian Reservations map. Use the information on the map, to help you understand the data. List the reservations according to the date the reservations were established- earliest to latest. Then list the reservations according to size – largest to smallest. 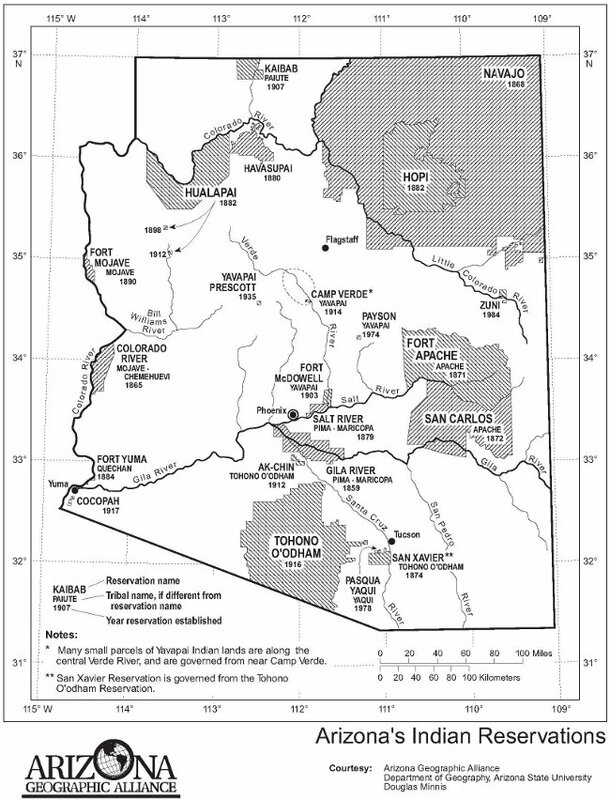 Study the Arizona Geographic Alliance’s Arizona’s Indian Reservations map. Use the information on the map, to help you understand the data. Match reservations to the nearest body of water, a necessity for all communities. 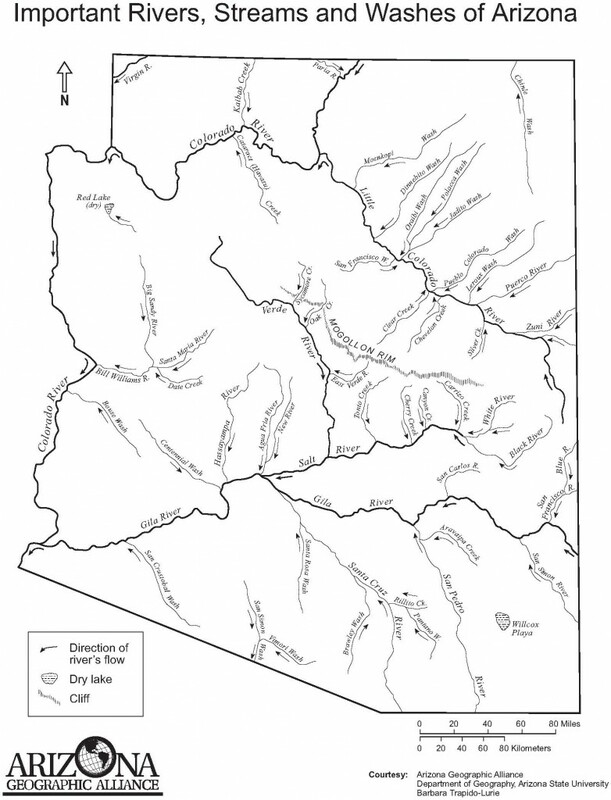 View the interactive map indicating the Sky Islands of SE Arizona. Click on stars for more information. Write down 12 new facts you learn by reading the information pull-downs. 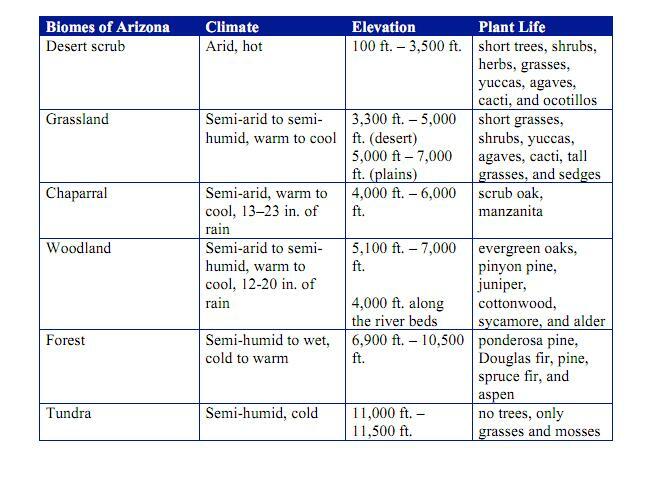 Click to View the Sky Islands Map Read through the Arizona Biome Data Chart. Make a layered book that includes the information and graphic or visual representations of each biome. Include flora and fauna in your visuals. Go to the following website to learn how to make a layered book. Skip to page 23 for the directions for the layered book foldable. 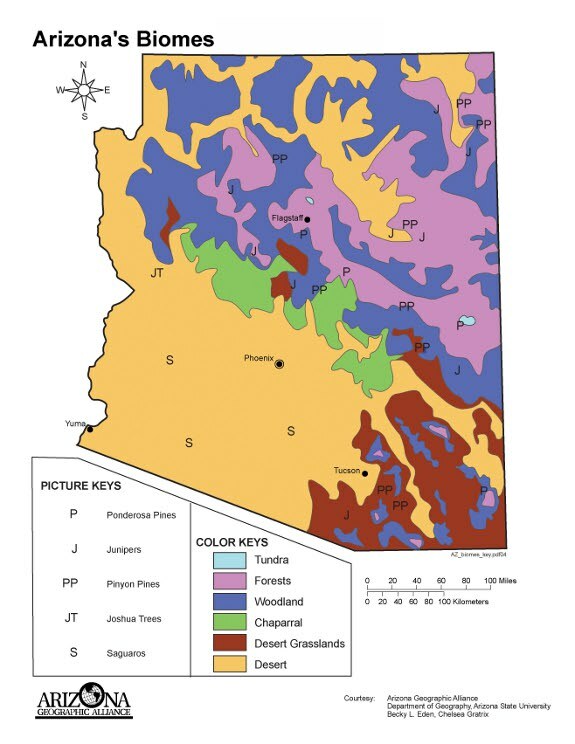 Complete the Arizona Biomes and Elevation Mapby coloring the key and then the map with the correct biome. Use the colored map key to help you identify the biome regions. Read the Biomes Data Table to learn more. Then make a Biomes Mobile using the name cards provided and following the directions for mobile construction. Research the two deserts that intersect in the Sky Islands region: Chihuahuan Desert and the Sonoran Desert. Make a chart comparing the two deserts. Pick six (6) categories that you will compare. For example, you could compare size and location. Pick two (2) of the mountain ranges within the Sky Islands region shown on the map. Make either brochures, a website or an audio file or podcast for visitors who want to hike the mountains, camp and take photos of the flora and fauna they encounter. Remember that Esperanza and her family lived at the foot of the Rincon Mountains, one of the ranges in the Sky Islands; a description of her ranch starts on page 96 of the book. So, your choice could be to learn more about the Rincon Mountains. Use the biome name cards to label the biomes. Add your own drawings to illustrate each biome. Use the Biome Data Table to help you with this task. Research each of the identified plants or trees from the Table. Arrange the biome cards from desert elevation at the bottom to forest elevation at the top of the mobile. Use string or yarn and chop sticks to create the elevation/biome mobile. Review the map titled, “Southwest United States: Topography and Rivers.” Use the map legend (key) to help you interpret the data on the map. Then, summarize 10 general Southwest Topography facts that you learned by studying the map. For example, it is clear that Southern California has only the Colorado River as a source of water. That information could be your first fact. What else can you surmise based on the lack of rivers in that region of California? 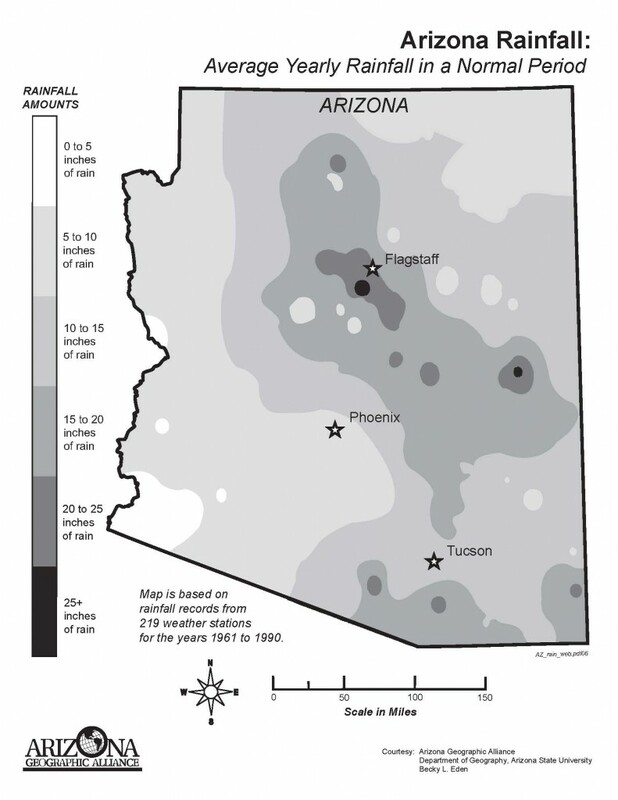 Review the “Arizona Rainfall” map. Notice the map is displaying the average information about a normal rainfall year in Arizona. AZ has been in drought conditions for the past decade, meaning AZ is getting less rain than the map shows. View the drought conditions monitor at Click to View the Drought Conditions Monitor. 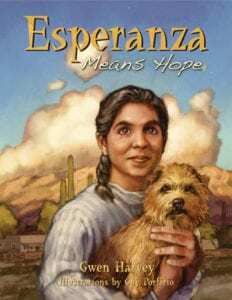 In Chapter 14, page 137 of Esperanza Means Hope, Esperanza and Carlos get caught in a sudden rain downpour. Describe the cloudburst event in your own words in a written paragraph. Add a second paragraph about your own experiences with sudden and violent rainy weather in Arizona. Choose one watershed system and write a report about it. Refer to the “Watershed Report Guidelines” to help you organize your report. You may wish to choose either the Santa Cruz or San Pedro watersheds for your report because both regions were important to Esperanza and her family.